On a day when once again most students at primary, secondary, and third-level are staying at home because of bad weather and cancelled classes, it is interesting to note that on-line education could provide many options for students so that they don't miss classes. I am at home again today too - but at least I can do some work from home (thanks to Moodle I can mark some assignments, and I'm also doing some research into a possible new postgraduate programme on Business Intelligence). A big worry for me is that if the weather continues to cause cancellation of classes next week that I will not get the syllabus finished. Next week is week 13 of a 14-week semester - and I still have to cover material for which I have already set exam questions. The Irish Independent of the 24th November last has an article on Why more and more smart students are staying home from college. The article (no author given in on-line version) states that "Irish third-level colleges have been slow to let their students study over the Internet and off campus, but that may now be changing". Yesterday I asked the question Will Universities be Destroyed?, because so much quality educational material is now on-line. The Independent reports that the number of students taking courses on-line provided by the Institutes of Technology has grown by 31% in the last year. Sligo IT has lead the way for many years with its Open and Distance Learning courses - you can take certificates, degrees, and even postgraduate degrees on-line. My own College is now offering a blended learning version of our popular Certificate in First-Line Management. Exciting times ahead should this prove a success. 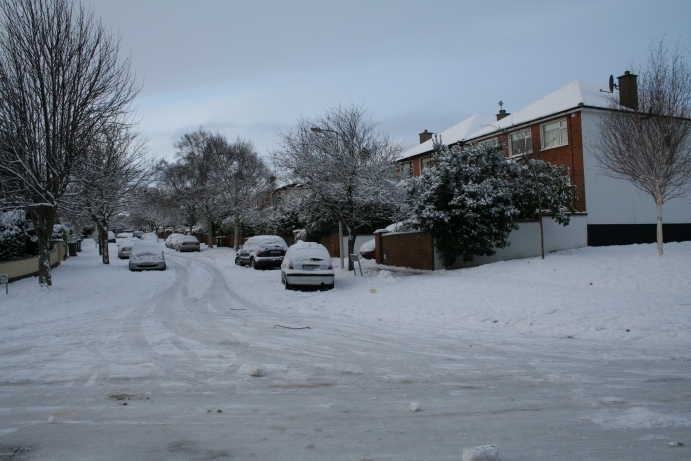 There is a lot of snow on the ground still, with lots more to come today according to Met Éireann, who seem to have got every prediction about the snow right so far. It's the heaviest snow in Richmond since we moved here in 1996 - I took the photo to the right this morning. Our road does not get treated with salt or grit - the compacted snow and ice on the road is about 2" thick. Great to see the neighbourhood kids out yesterday having snowball fights and building snowmen.